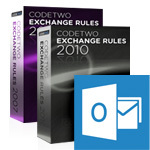 CodeTwo Exchange Rules 2007 and 2010 – support for Outlook 2013! We have just released an update to CodeTwo Exchange Rules 2007 and CodeTwo Exchange Rules 2010, our signatures and disclaimers management tools for Microsoft Exchange admins. The programs are now fully compatible with Microsoft Outlook 2013 mail. If you have any doubts or questions, our technical support team is always willing to help you. Click here to contact them directly. For more information about these tools go to this page (for Exchange 2007) and to this page (for Exchange 2010).